The current financial year hasn’t been good for Sega Sammy (SEGA) (TYO:6460). In both the first quarter and first half results, a significant slowdown in both revenue and profits were noted. 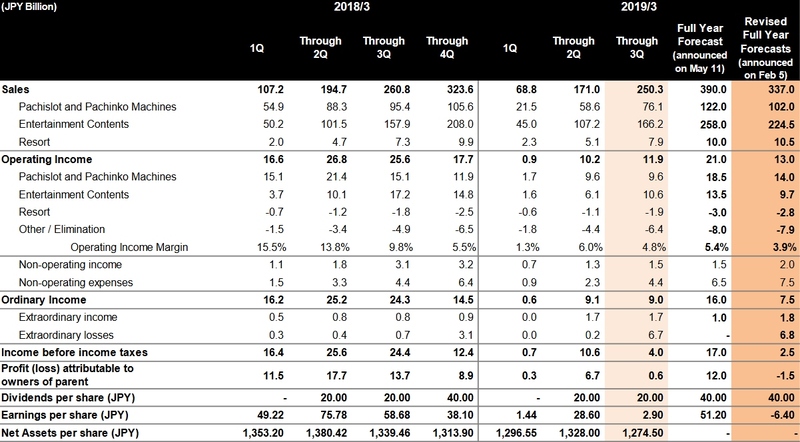 As reported in SEGA’s Q3 financial statement and appendix, the slowdown has continued despite the release of new titles, with digital games actually proving to be a loss maker. For the nine-months ending December 31st, 2018, the company posted total sales of ¥250.3 billion, a 4% year on year fall from last year’s ¥260.8bn. Operating income from this has fallen to a much larger degree, bringing in ¥11.9bn, a 53.5% fall from last year’s ¥25.6bn. Operating income has fallen across all three of the company’s segments despite increasing revenue in both Entertainment Contents and Resorts. Pachinko and Pachislot have proven to be the biggest losers of the current year for SEGA. As with other Japanese companies like Konami (TYO:9766) and Capcom (TYO:9697), the division have been in a constant downturn – though this is far more noticeable for SEGA as it makes up a much larger portion of their revenue and profits. Sales from this section have dropped 20.3%, from ¥95.4bn to ¥76.1bn. Operating Income fell 36.7%, from ¥15.1bn to ¥9.6bn. Fortunately for the company, the Entertainment section has proven to be more resilient, though not in its entirety. Digital Games, marking SEGA’s online offerings, have flagged as a result of services for ageing titles being terminated and marked a net loss of ¥2.7bn, showing a ¥6bn decrease on last year. Fortunately, this is the only area that has seen this downturn. In the packaged game software field, sales amounted to 18,510 thousand copies (14,280 thousand copies for the same period in the previous fiscal year), thanks to the sales of the new titles including “Football Manager 2019” and “Judgment” and continuous contribution of repeat sales from previously launched titles (catalog titles). During the first half expectations were for Amusements to continue working as a strong area for the company, thanks to the release of a number of new machines. This has proven to be correct, with the sales of machines and the operations of Amusement Centres coming to a total of ¥71.6bn compared to last year’s ¥63.1bn. In the amusement machine field, the Group implemented the sale with a focus continuously on prize game machines. In the amusement center operations field, amusement center operations were conducted with a focus on prizes, like-for-like sales at the existing game center operations were 104.2% compared with the same period of the previous fiscal year. Animations and Toys make up the remainder of Entertainment section, showing a slight increase of revenue and operating income, ¥1.4bn and ¥0.1bn respectively. Outside of Entertainment SEGA also operates in the resort industry. As a result of renovations, footfall has increased which has increased sales, but current investment in resorts leaves the area with a loss of ¥1.9bn. As a result of the current poor performance during the financial year, SEGA has revised almost every figure downwards. Full-year revenue has been lowered from the initial forecast of ¥390bn to ¥337bn. Operating income has been forecast to lower in line, from ¥21bn to ¥13bn. While resorts are expected to trend upwards, Entertainment Contents, primarily video games, seems to be the area that SEGA is hoping has the best fourth quarter. This does have the potential thanks to a number of releases. Earlier this month the PC remaster of Catherine was released, with Catherine: Full Body remake is set to release early this year. Furthermore, Total War: Three Kingdoms will be released, a consistent title for the company. Outside of core games, there are also plans to launch Ryu Ga Gotoku Online to bolster the flagging digital games section. Further afield is the primary concern for SEGA now. 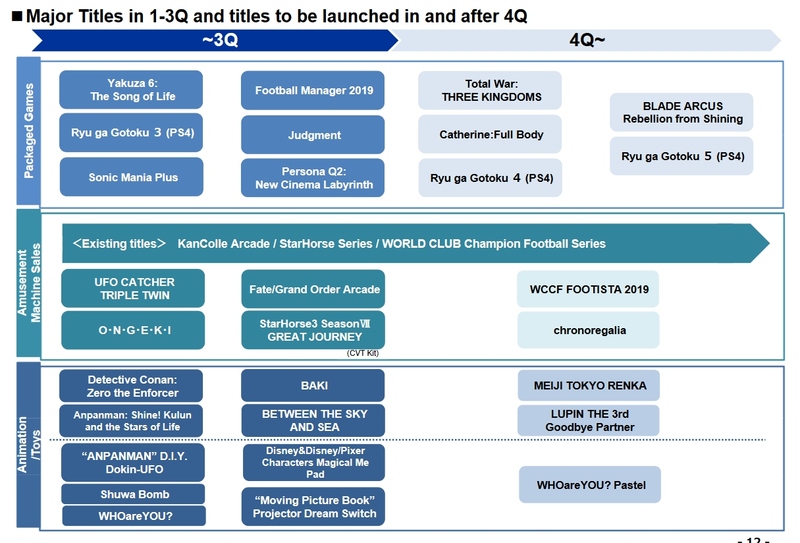 A number of titles will make their way west, including Judgement and Persona Q2: New Cinema Labyrinth, also the likely western and PC releases of further Yakuza titles. Team Sonic Racing is scheduled to launch during Q1 of the next financial year, with future titles like Football Manager and Total War to further bolster sales. SEGA would no doubt be best off using this year as a platform to further expand their packaged gamed range over the coming year. As with other Japanese companies they will also be hoping the changes to the industry will help rejuvenate their Pachinko/Pachislot entertainment segment. Until that time, they will likely be best focusing on the areas that are performing well, as well as aiming for current investments to further bolster the resort business which has a tie-in to other areas. © 2019 WCCF PTE LTD. All rights reserved.